A happy and pleasant surprise has just arrived through the post at home. I commented some time ago about celebrity gardeners and Adam the Gardener in particular. Adam featured in a pictorial guide each week in the Daily Express from the 1940’s. The tips and advice helped many experienced gardeners and those new to gardening. The clever publishers at Chatto & Windus have reproduced the 1940’s classic in a revival of the old tips and advice and they kindly sent me a copy. I recommended the book earlier and am pleased to do so again – it is available now from Amazon. At £10 it is a great price for a hardback containing so many words of gardening wisdom. It would also make a good nostalgic fathers day present. As they say a picture saves a thousand words. 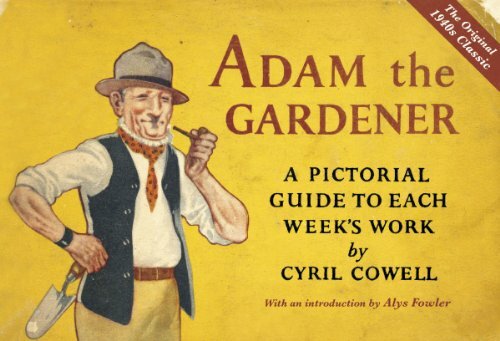 The strip format of Adam the Gardener allows time for more gardening than reading. That way I hope you can recover from frosting accidents – I recon it will still be frosty at night for most of May the way our weather is right now. I have a two year old Acer Katsura tree. We had heavy snow this winter and the top 2 foot of the tree have no sign of any leaves at all. There are plenty of leaves appearing from ground level up to about 2 foot. I believe these trees are usually grafted, and am wondering if this is the trouble. If so, could you tell me if I should cut off the top 2 foot and hope it continues to grow from there, or just leave it for the time being and see what happens.